Our culture is a walking contradiction. Drives me crazy. We are on board with Stephen Hawking, Richard Dawkins, or any “professional” atheist writing today…then these same people buying the books of these methodologically inept charlatans of logic, flock to theaters to see a movie about nothing more, or less, than our fascination with the paranormal and the hunch we all have that grandma is floating around us, just over our left shoulder to be exact. If you want to throw off mythos, just embrace Reformation theology…you don’t need to be an agnostic kool-aid drinker. There are plenty of rationalists to choose from. As a culture we lap up, in giant proportions, anything that can effectively deconstruct the mysterious and ambivalent, the numinous and the holy, only to find ourselves making small budget films such as The Conjuring and Paranormal Activity weekend box office smashes. We can’t believe in the hope of a valley of dry bones, but those orbs in our pictures, you know, the ones floating around our kids in all those family photos, those are the real deal…certainly more real than any sort of kerygmatic utterance that has given birth to a faith that refuses occupation from the culture around it…even if the evangelical right has failed to grasp the memo. We hurriedly rush to be “intellectual” and “scientific” and deny the dogmatic claims of faith…fools rush in where even angels fear to trod. It has become in-vogue to trash faith, downplay theology, point out the idiocy of structures of belief (and I admit, much of what claims Christianity today is downright stupid). Even complete idiots think they are smart just because they can utter the senseless words, “I don’t believe in God,” quote Bart Ehrman, or even follow Betrand Russell down his path of Christic critique when he notes that Jesus miserably failed to have his pulse on eschatology. Anything and everything that might tear down the metaphysical/that alongside the physical/paranormal…is embraced as if it’s the new intellectualism…yet these same people that want to evacuate faith for nothing more than a misplaced sense of coolness (or a idolatrous sense of empiricism) embrace the very platonic worlds of embodiment they wish to bankrupt when they deny the most paranormal event of them all: the resurrection of the Christ. In other words…for a culture that is obsessed with being “historical” and “scientific” we sure are quick ditch Jesus and embrace Casper. The resurrection is nonsense, but living forever in a soulish existence is perfectly logical. Jesus is garbage, resurrection is nonsense and ahistorical dreaming, but I know my grandpa gave me this vision from beyond the grave! But this is problematic because the answers of science and history (besides the fact they are both biased and limited) are not able to give us an answer to the ultimate question of thinking our own non-thinking dead self. We are beings toward Death…Heidegger was correct. We cannot avoid this…and being a Humean (a follower of David Hume’s thought) doesn’t change the fact that we all reckon with death even if we think it to be nothing more than an uncertain void. Our lives are marked in relation to our deaths because only in relation to our deaths can our lives have meant anything. The beginning is such only in relation to its ending. Our lives are not the infinity of totality until the total has been subsumed into the infinite. In The Conjuring, the scary movie that has recently taken the country by storm, it became apparent that the very thing that we fear as a culture is the very thing we cannot let go of: death. We are not interested in conjuring any ideas of the Christ, faith, or resurrection, those are all nonsense but we are very interested in conjuring the paranormal outside the parameters by which the paranormal has been thought for millennia: faith, hope, God and a holy respect for mystery. We fill our own sense of existential wrath (that our bodies will eventually die) with answers that we can live with, rather than answers that wish to unsettle that with which we live. The resurrection, or hope in that which we cannot control, we evacuate for the more believable and apprehendable view of a soul that will outlive our bodies and exist in some sense of temporality wherein we can communicate with our loved ones or even make ourselves into family photos as perfectly round cylinders…or better yet, perhaps we’ll be able to speak to our loved ones via the Long Island Medium one day. We spend our entire lives trying to run from death, thinking our living apart from our dying, yet the dying fascinates us more than the living…we are infatuated with what happens after we die and with the latent presence of death that surrounds us in the very idea of the disembodied spirits of others…even to the point that Christians have conjured a view that dying is in fact better than living! Tell that to the person that died. We look at death as if it’s a celebration rather than what it really is…the cold hard fact that the Rider on the Ashen Horse…the rider named Hades and Death (and for anyone that has experienced his swiftness experiencing a death is hell…See Revelation 6.7-8) is still very much at work and has not yet been fully defeated by the One on the White Horse. The First Fruits of a Resurrected Christ have not yet produced subsequent harvests as Jesus, Paul and the Apostles all presumed were imminently pending. and romanticizing it in some weird form of Christian Gnosticism or discounting Christian ideas such as the paranormal reality of resurrection only to embrace ghosts and goblins (as does The Conjuring) instead is utterly ridiculous. Makes no sense. Christians are so scared of dying they make up heaven and their favorite biblical chapter is the aliteral Revelation 21…and the anti-Christians are so scared of dying they embrace “spirituality” or spiritual things such as The Conjuring and in the process continue to live forever thanks to the Greeks…oh the stories we will tell ourselves about ourselves to make our aimless lives less pathetic. In The Conjuring, death is everywhere and it becomes incarnated via some very stark images. Death resides as a dark presence behind the family that occupies the haunted house. The family is oblivious to its presence but the seer can see it. Death is hanging by the neck right above the head of an unbeknownst character…its feet dangling overheard as we feel the breeze of its toes brush past our neck. Death lives behind the door in that dark place we cannot see…climbing its ways onto our beds…tugging at us, pulling us, pressing upon us…and its stench reminds us that this idea we have of death is not as surreal as we first imagined. Death is guiding our families up stair wells and stair cases…causing us to beat our proverbial heads into those spaces where we think can save ourselves from its evil nothingness. Death is present. It is absent. It is unruly. It is random. It is filthy. It is unkept. It is chaotic. And for now, it is final. Death is the residue of creation that demands some reckoning with its absent presence. This is why scary movies work. It’s not the scenes on the screen that bother us…it’s that the scenes on the screen will not stay on the screen and will make their creepy way into our lives, jeopardizing our living. That’s why we jump when things go bump in the night after watching great possession movies like The Conjuring. The Conjuring doesn’t bother us…it’s that we too might be conjured and thereby be dead. And that followers of Jesus have evacuated resurrection and embraced The Conjuring of our Souls via The Conjuring Christ…the ultimate seer…is equally ridiculous and maybe even borderline heretical. Most people in America believe in the concept of a soul. Most people believe that this soul leaves the body and goes somewhere after death. Christians somehow embrace the Pauline idea that “to be absent in the body is to be present with the Lord”…and also is to be present with me in my house when I feel that sudden waft of cold air that is obviously my dead god-fearing grandmother. Many people believe there are spirits, evil and good, warring against us, and each other, on a daily basis. Christians and anti-Christ’s both use the language that the deceased person is in a better place. Many Christians believe in a literal devil that literally got himself and a 1/3 of all the angels kicked out of heaven (for you KJV readers who think this, you’ll need an Apocrypha to find this story)…and that on their way to hell they have been given free pass to exit and enter hell as they enter and exit weak people whom they might possess. These evil spirits are what possess us and the historically innocent victims of the movie. When Christians see The Conjuring…they absolutely think this entire episode could be likely, at least on a minor scale. And many more conservative Christians would never even watch this movie for fear that they might have exposure to those said evil spirits and bring them to their homes. Many non-Christians, like the ones on those TLC shows that hunt ghosts, for some weird reason invoke Christian rites when dealing with evil spirits. People who claim no faith, even the protoganist demonologists in the movie, The Conjuring, don’t show a particular commitment to Christianity, though they use Christian symbols and rites in their anti-conjuring efforts. The very faith that many people think improbable is at least probably effective on the more probable reality of spirits in our midst…yet those rites are given their efficacy on the very event they deny as improbable: the resurrection of Jesus whom we call the Christ. Can someone explain this to me? In other words, there are some very generally accepted ideas about death, what it is, what it means, who survives it, where they go, what they do, and how all this relates to infinitely evil and good spirits that many believe are part of the primordial beginnings of creation. All this typically surrounds conversation of our “spirit” or “soul” and very little can be delineated by way of difference on these ideas whether one is speaking to a Christian layperson or an anti-Christian post-modern American. So the non-faithful are embracing the rites of faith, efficacious only on the ridiculous ideas of Jesus and his resurrection, which they don’t believe in…AND the idea of death shared by pro and anti-Christ people is virtually synonymous at a cultural level. If Christian ideas of beginning and middle are so very different from the narrative of secularity and culture…then why do we as Christians share so closely the view of endings we find to be common currency by those who could care less about Christ? If beginnings and endings matter…and the beginning of Hawking, et al, is so very dissimilar to the beginnings we found on the Holy, then why are our ideas of ending virtually similar in how we construct them? If our theology and faith matter, and it matters because of the answers and practices it imposes upon us that choose to follow The Way, then our theology should lead us to a different pronouncement than that shared by The Conjuring…and a culture that seems to have little trouble embracing the pagan idea of a soul but can easily laugh at the idea of resurrection. There’s a reason that the paranormal is romanticized and fantasized in the form of spirits/souls…and why Zombies are killed. Dead people don’t come back in the flesh…this is unacceptable and would constitute an Apocalypse (I think biblical authors could agree here). There is nothing Christian about believing with everyone else that manifestations of The Conjuring and its subsequent manifestations of soulish flights to heaven (or hell) are “what happens” or “could happen” after we die. Even the Greeks believe this. What is Christian is not providing ontic purchase to those things that call themselves real while denying reality to the event by which all reality must stand in measure: the resurrection of one they call the Christ. Thinking our death is one of the most difficult things to honestly do…thinking our non-existence. Death is not just a residue, or remainder, of all those who have been born and died so that we too might also be born and die, but from a Christian theological perspective death is a theological residue of the resurrection. 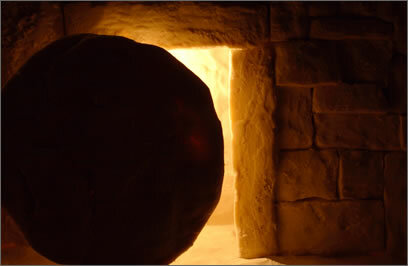 Jesus, as the resurrected one, leaves behind a millennia of tombs that are still coated with the presence of death. The tombs have not given up their dead…the residue simply thickens as history progresses. Existentially, this bothers us…death bothers us. It is such a bother that even those that want to completely throw off the paranormality of metaphysics are left embracing some bizarre form of metaphysics in order to feel good about what happens when they are done living their hedonistic lives…and Christians do the same, only in obverse. Christians embrace a bizarre metaphysics of existence as a reward for physical deprecation. In the end, they both hope in the same thing…the same status and form of existence…and the Christian just makes themselves feel better because at least their soul makes its way beside Lazarus. As my former professor of Church history would never tire of telling us, form and content people, form and content…two sides of the same coin. But maybe there is a third way. We do not need a Conjuring Christ to call forth our platonic souls from their evil material cages when we die. We do not need a Christ to Conjure us with his magic and all of a sudden make known what is only now perceived via our ability to reason and the fountain of our vision. No! To believe that Christ is a conjurer of dead people is to believe he is nothing more than some sort of spiritual witch, an extension of God’s self that does things that he tells others in the biblical narrative to flee…like pursuing seers and diviners. Jesus is not a conjurer and God is not the collective holder of Plotinus’ basket of souls that are at home in the being of God waiting to be dropped into this miserable thing we call “flesh” (shout out to my Southern Baptists if you will). What we need is to divest ourselves from these fallacies and have a theology and faith that is consistent from beginning to end. We need to affirm an ending that is marked by its beginning and vice versa. We need to be unique in our idea of hope, not only in regard to things such as soteriology, Christology, etc., but also extend that uniquely Christian flavor to our ideas of eschatology, the consummation of history…extend our uniqueness to our idea of death. D. Stephen Long, in his book The Goodness of God, notes that a good life is marked by an equally good death and that we as a culture, specifically as a church, have forgotten how to die good deaths. I have pondered this idea for many years now and what it might mean. Perhaps, part of dying a good death is not placing our hope in something we have always been taught and presume it to be biblical…but maybe a good death begins when we are aware that our beginning and ending all end up in the same place: in the empty tomb of Christ that marks our birth and resurrection into the infinity of divine mystery. The Conjuring Christ is not the one that sits by our death beds and gives us the options to haunt our relatives, or take flight to heavenly bliss…a good death is not marked by the certainty of the soul conjurer we call Jesus. A good death is relegating our very existence into the grace that we cannot understand and into that mystery we call God…and our hope is that in that space is one/One who is/was Resurrected.